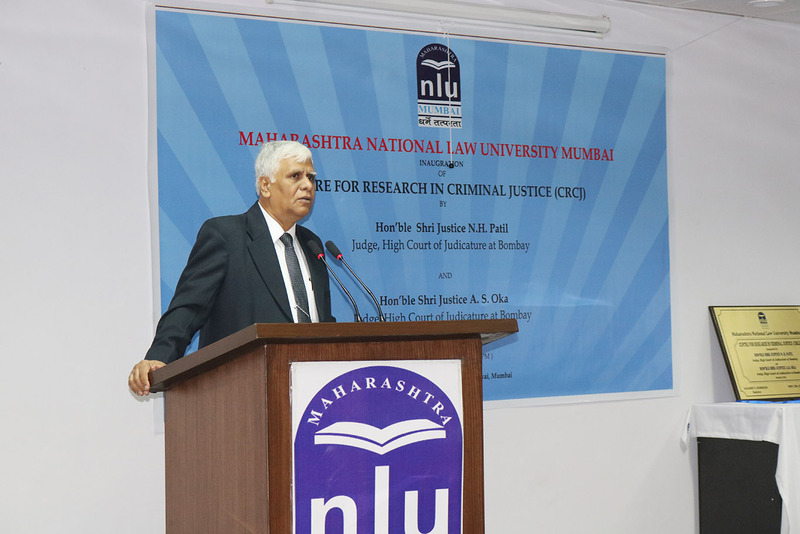 January 13th, 2018 | Maharashtra National Law University Mumbai (MNLU Mumbai) inaugurated the Centre for Research in Criminal Justice (CRCJ) today. CRCJ is an initiative of the University to improve research in criminal justice administration and to make a quality contribution towards an efficient criminal justice administration through the active participation of students, judiciary, civil society members and other relevant stakeholders. 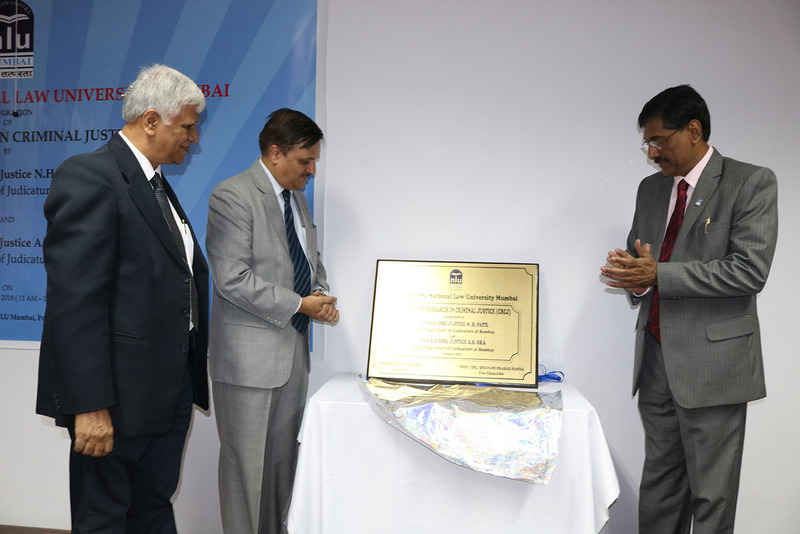 The centre was inaugurated by Hon’ble Justice N.H. Patil and Justice A.S. Oka, Judges of High Court of Judicature at Bombay. In the welcome address, Prof. (Dr.) B.P Panda, Vice Chancellor of MNLU Mumbai, highlighted the present status of the criminal justice system in India and role of CRCJ towards a quality research and hence betterment of criminal justice administration. Further, Mr. Milind Sathe (President, Bombay Bar Association) addressed the session wherein he highlighted the journey of criminal justice administration in India from 1773 till date through various landmark judgements. He emphasized on the synergy between technology and criminal justice system and suggested a blueprint to be followed by CRCJ for an effective and vibrant role towards enhancing the efficiency of Indian criminal justice administration. Mr. Ashutosh Kumbhakoni (Advocate General, Maharashtra) emphasised upon the role of society, the principle stakeholder in criminal justice towards achieving an efficient criminal justice administration. He also extended certain suggestions and mechanisms to be adopted by CRCJ in terms of efficient and qualitative contribution towards its enshrined objectives. 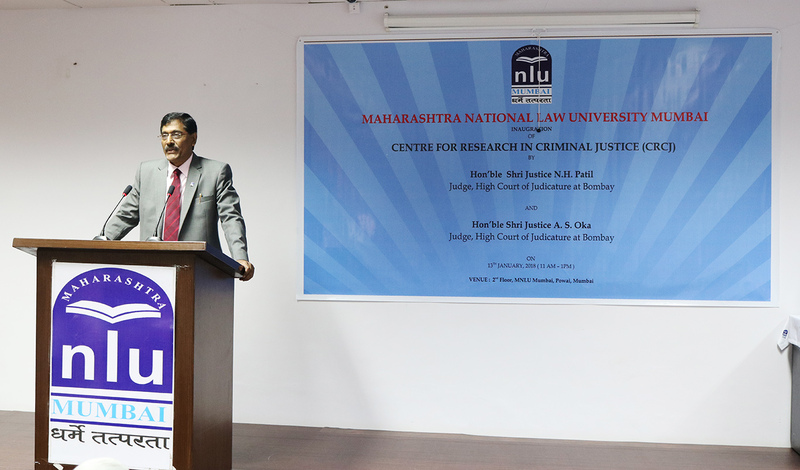 Hon’ble Mr. Justice A.S. Oka (Judge, High Court of Bombay) highlighted the objective behind establishing NLUs across India and the role of CRCJ towards attaining that objective. He further urged the dignitaries present to extend all possible support and cooperation to make CRCJ a success. Hon’ble Justice N.H. Patil (Judge, High Court of Bombay) dealt with the lack of proper investigation procedure in criminal investigations in India and its adverse consequence on criminal justice administration. He emphasized on the need to have a proper scientific investigation mechanism in place so as to deal with the prosecution of criminal cases effectively. He proposed certain areas of research within the realm of criminal administration system that could be undertaken by CRCJ including the existing flaws in criminal investigation system, hindrances in fair and efficient trials, prison reforms systems, role of media in sensitive criminal cases and role of public prosecutors. The inaugural session concluded with a vote of Thanks by Mr. Sadashiv S. Deshmukh (Registrar, MNLU Mumbai). A roundtable on Challenges to Criminal Justice Administration in Maharashtra was held after the event wherein the members of the judiciary, the bar and academia participated.